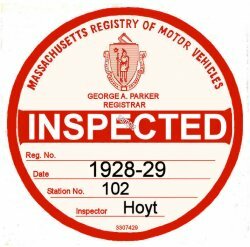 1928-29 Massachusetts INSPECTION Sticker - $20.00 : Bob Hoyts Classic Inspection Stickers, Add a Final Touch to your Restoration! Here is a beautiful reproduction of what is certainly the very first year Massachusetts issued Inspection stickers. It, along with Pennsylvania were the first two states to issue inspection stickers. PA and Massachusetts in 1928. Mass probably followed PA in late 1928. This original sticker was dated 1928 but it is thought that it was issued so late in the year that it was carried over to 1929. Our evidence suggests that the second Mass sticker was a 1930. Look at the 1928 and 1929 PA stickers and be amazed. Did Massachusetts copy Pennsylvania? Did the same company produce the first two years at the same time. We think Mass 1930 was a year behind as we do not believe we have any missing original stickers for either state. The two state stickers are almost identical. This sticker has space on the front for car tag number and can be ordered for an additional $10.00 with your own car's antique tag number.